Humans should not harm dogs but should treat them well instead. Dogs are our most faithful friends; some are even our benefactors. My life was once saved by the grace of a dog. My mother died forty days after giving birth to me. As our family was very poor, my uncle (my mother's brother) could only feed me wheat paste every day, and my little life hung on. Five months later, my uncle's big brown dog gave birth to puppies, so my uncle started feeding me her milk. After some time, he would bring the dog and let her nurse me directly. Realizing my needs, the clever dog needed no instruction to come and feed me whenever it was time. A deep affection grew between the big brown dog and my family. When my uncle died, the dog missed him so much that she soon departed from the world. I was only twenty months old then, but I cried as if my heart was broken, which was told to me when I grew up. 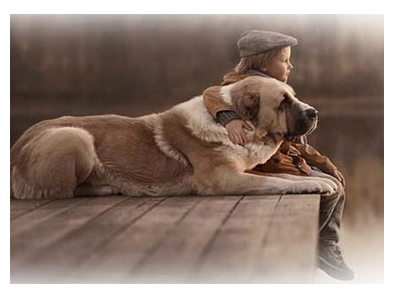 It is no wonder that I have had great affection for dogs since childhood and always feel grateful to them. I could not have survived and lived to this day if not for the big brown dog that nursed me.